Son of Dracula is a very interesting entry into Universal Pictures’ series of Dracula movies — and not only due to Lon Chaney Jr. playing the title character — although Chaney does a good job. He portrays Dracula (or Alucard, if you prefer) as a very powerful, savage creature, with only a veneer of culture and civilization. I frankly enjoyed his portrayal very much — although his southern accent was totally out of place for a European character. But as I say, Chaney’s depiction isn’t the only reason that I enjoyed Son of Dracula. The real “monster” of the film is a human being — someone who has a fear of death that is more than macabre and concocts a plot to achieve “immortality” of a sort. By being turned into one of the undead by Chaney’s Dracula, then scheming to destroy Dracula, and next turn her human boyfriend into another of the undead, so that they can “live” happily ever after. The human boyfriend (Robert Paige) will have none of it, however. Realizing that it would only be a soulless parody of human existence. I would be remiss to not mention the talents of Evelyn Ankers, the famous “scream queen” here, doing what she does best — and most often. 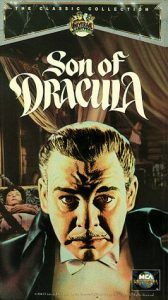 Son of Dracula is a worthy entry in the Dracula series, with a focus on the human elements, and I recommend it. Frank Stanley (Robert Paige, Bye Bye Birdie, Can’t Stop Singing). The handsome young man; our protaganist, who’s in love with Katherine. Katherine Caldwell (Louise Allbritton, Who Done It?, The Egg and I). The beautiful, young, sad young woman, with a terror of death. A terror that drives her to do anything to avoid it. Doctor Brewster (Frank Craven, Our Town, Sons of the Desert (writer)). The town doctor, from Carpathia, who knows the legend of Dracula. Professor Lazlo (J. Edward Bromberg, Invisible Agent, A Song is Born). The professor who assists in the pursuit of the vampire. 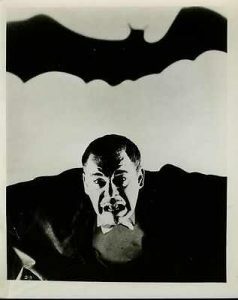 It was perhaps inevitable that, after playing the Wolf Man, Frankenstein’s monster, and the Mummy, Lon Chaney Jr. would round out his horror resumé with a turn at the great bloodsucker himself (not, as the title would suggest, his son). Looking dapper and dignified under the cape, if not exactly threatening, Chaney plays Count Alucard (that’s Dracula spelled backwards), a mysterious Carpathian summoned to America by a “morbid” heiress (Louise Allbritton). Eric Taylor’s script is rather clunky, but the story (by horror specialist Curt The Wolfman Siodmak) is often quite clever, playing like a supernatural twist on a psycho-thriller. Allbritton’s frustrated fiancée Robert Page accidentally “kills” her while trying to shoot Alucard (who imperiously stands up to the hail of bullets) and then goes stark raving mad as he watches the dead rise to life and the living disappear in wisps of smoke and morph into creaky stage bats. Harry: How are ya, doctor? Prof. Harry Brewster: Hi, Harry. Charlie, station agent: Hello Dr. Brewster, Mr. Stanley. Frank Stanley: How are ya. Say, uh, those all the passengers you have? Charlie, station agent: Just the four. Prof. Harry Brewster: You didn’t put anyone off at the wrong station, did you? We’re here to meet a friend of the Caldwells, a Count Alucard. Charlie, station agent: There was no Count on this train. All customers. Say – there was a lot of stuff in the baggage car that might belong to your Count. Prof. Harry Brewster: Thanks, we’ll take a look at it. Train Conductor Voice: [offscreen] All aboard. Frank Stanley: [looking at a pushcart piled with trunks and cases] Well, does this look as though he’s come to stay for just a couple of weeks? Prof. Harry Brewster: No, it doesn’t. I wonder what’s become of him? Frank Stanley: Probably coming by car. Don’t worry, he’ll show up. Frank Stanley: What are you mumbling about? Prof. Harry Brewster: Nothing, nothing. Just a silly idea hit me. Well, if there’s no Alucard, there’s no need of our staying around here. I’ve got to get back to the office. Count Dracula (Lon Chaney, Jr.): [as his coffin is burning] Put it out! Put it out, I tell ya’! Sheriff Dawes: You mean, that’s all that’s left of Count Alucard? Prof. Laszlo: Look at the ring on his hand. It bears the Alucard seal, just as on his luggage. Sheriff Dawes: Well assuming it is Alucard, or Dracula, or whoever he calls himself – where is Frank Stanley? He’s still wanted for murder. Prof. Harry Brewster: You still think that Frank killed Kay deliberately? Sheriff Dawes: Look, Doctor, I’m only the Sheriff. I’m not the Judge. It’s my job to bring him in, and the court’s to decide his guilt. Prof. Laszlo: Of course. But I think our testimony will have some bearing on their decision. Prof. Harry Brewster: Undoubtedly. But the main thing to do now is to find Frank – and I think I know where he is.